In January, Marine Corps Times profiled Lance Cpl. Kyle Carpenter. The wounded warrior has undergone more than 30 surgeries since sustaining catastrophic injuries in a November 2010 grenade blast near Marjah, Afghanistan, but maintains a strikingly cheerful outlook on life. Most of the quotes in that story from Carpenter came from an interview I did with him at the Walter Reed National Military Medical Center in Bethesda, Md. He was refreshingly candid about his struggles — and that he had a number of goals left to meet. 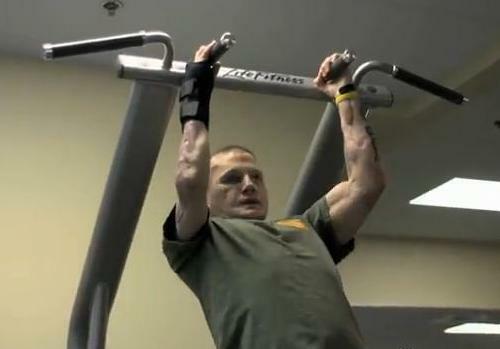 One of those goals was doing pull-ups again, even after his right arm was broken in more than 30 places by the grenade explosion. He’s written about it before on his Facebook page, Operation Kyle, and no doubt put hundreds of hours of work to strengthen his arm enough to do them. As Kyle himself would quickly point out, he’s just one of many wounded warriors putting in this kind of work to recover from devastating injuries. Just a little daily motivation for all of us. Sara Davidson is an ultrarunner and contributor to PT365. She trained for the 2014 Marine Corps Marathon using our PT365 Run Plans. Email her at sdavidson@gannett.com .